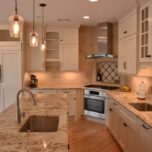 Increase the storage and functionality of your kitchen with cost-effective kitchen cabinet organizational items. 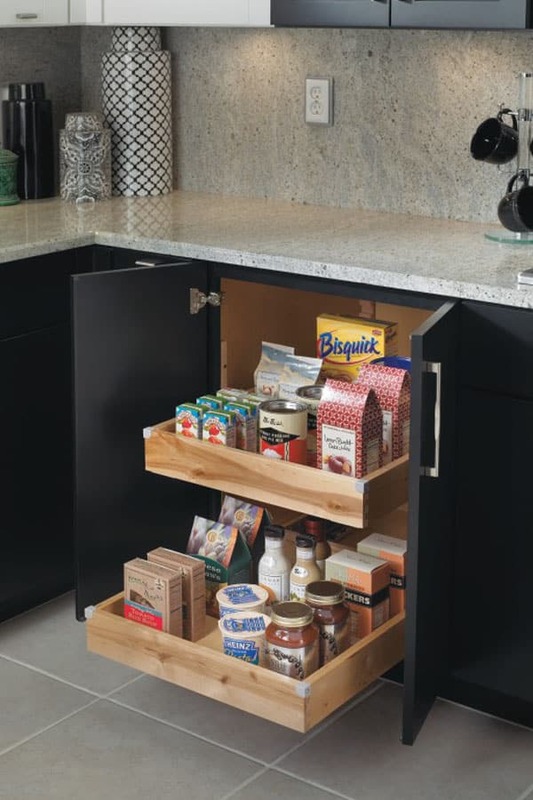 Cabinet organizers are the perfect addition to help you know your way around the kitchen. 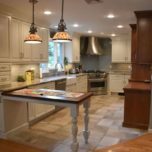 Kitchen cabinets come with a standard adjustable shelf which can be upgraded with a rollout or multiple rollouts, typically in a base or utility style cabinet with a depth of at least 18 inches, any less than that and the rollout would not be too useful. 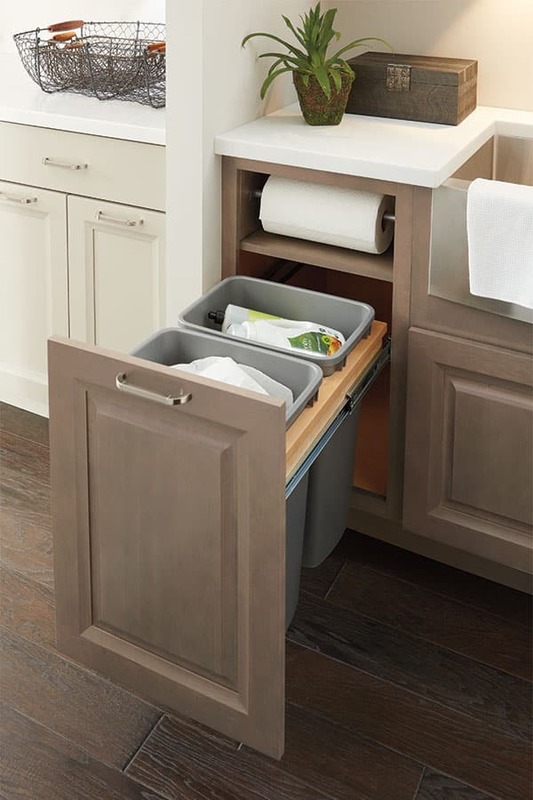 The standard depth of a base or utility cabinet would be 24 inches and is too deep to reference the items near the back of the cabinet, the addition of a rollout shelves makes use of the entire cabinet by allowing you to see what is in the back. In addition, many rollout shelves come with easy to use options for adjust-ability allowing you to easily move the location of the roll out as your needs change. 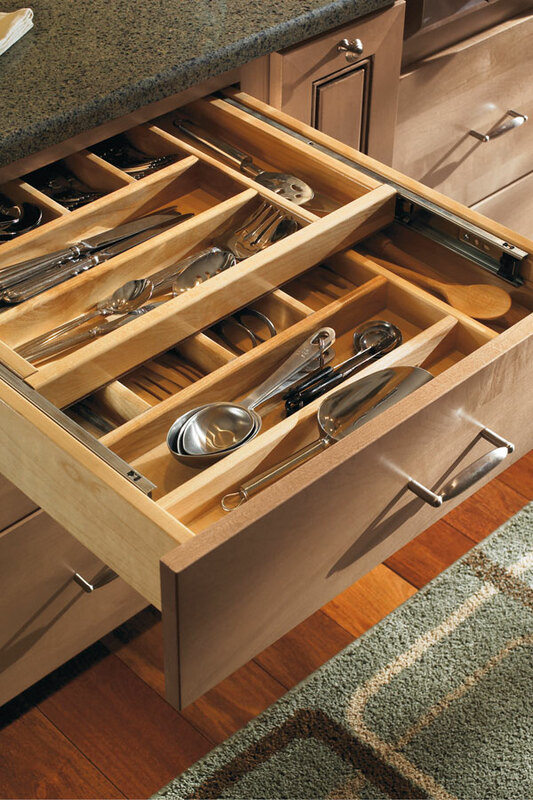 There are so many great ways to organize your kitchen drawers, some are standard features like a wooden cutlery divider or an angled utensil divider and others are more custom features like knife drawers that are molded to the exact set of knives you have selected. The cutlery divider is come in either a single level or a two-tiered model to better organize smaller items. 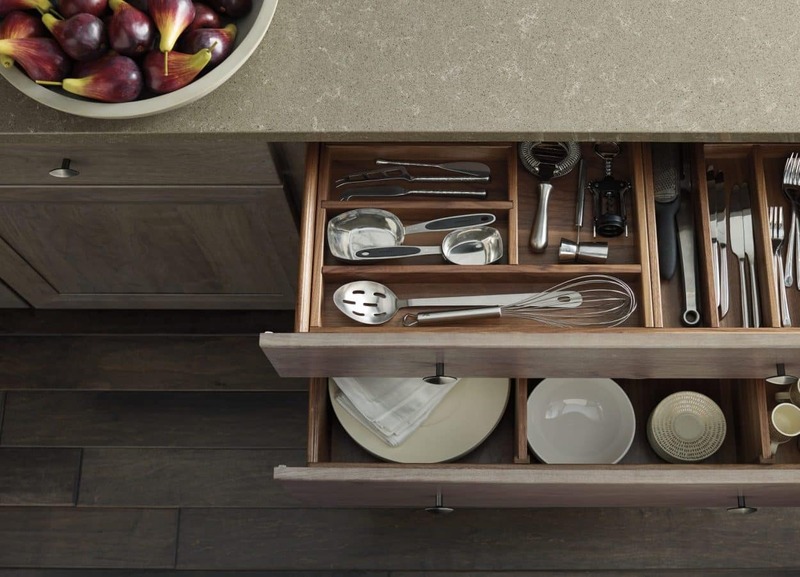 The angled utensil divider is an ingenious way to have long items like wooden spoons, rolling pins, bottle opener’s and other small items all neatly organized and one large drawer. 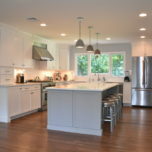 Cabinet with built-in trash or recycling cans are a must have in today’s kitchens. 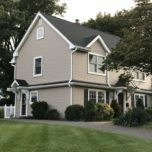 Some Space planning considerations need to be made in advance to ensure you get the size and or quantity you were looking for. In an 18 inch wide base cabinet comes a single 50 quart can, in order to have a double 50 quart can you would need a 21 inch wide base cabinet. 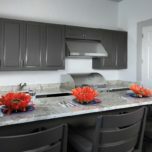 Some of the latest models even have a spot for your paper towels! 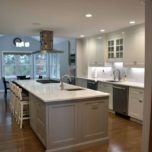 Look for cabinets that have built-in trash or recycling containers that are built was a sturdy wooden construction, preferably dovetail box and heavy duty Undermount soft close drawer glides. These units take a lot of stress and see a lot of action in their lifetime so it’s important to make sure they are well-made. Adding a tray divider to a base cabinet is a great way to not only free up space in other cabinets since it reduces the need to stack items on top of each other and it allows you to organize your trays and cutting boards in a way that makes sense for how you use them. Now you will have no excuse to make that recipe that requires the muffin tin of the bottom of the cabinet! 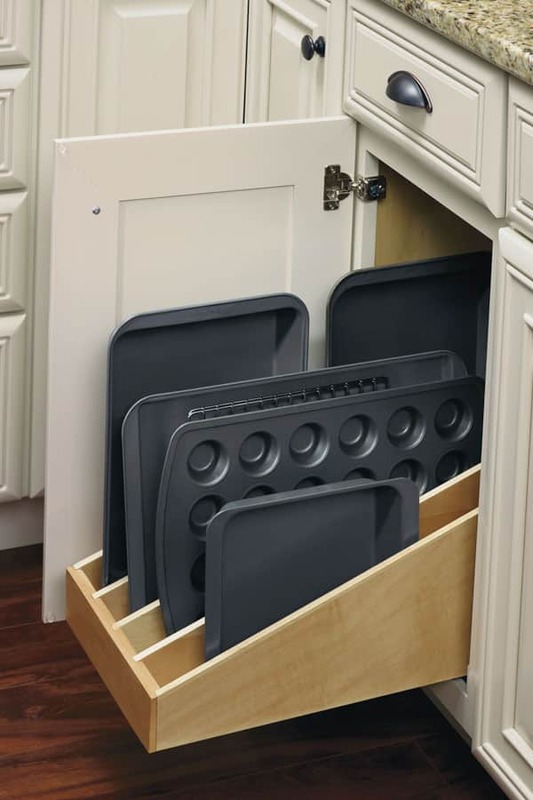 In addition to baking sheets, muffin tins, and cutting boards, the base cabinet tray divider can also be used for pizza stones. 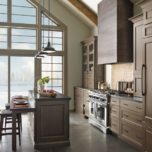 Cabinet companies like Schrock and Decora Cabinets offer plenty of solutions when it comes to organizing spices, however, other solutions exist at aftermarket suppliers such as the container store, bed bath and beyond, Rev-A-Shelf and so on. When it comes to spice organization it’s really all about use and accessibility, having spices neatly organized in an inconvenient place does the cook no good. 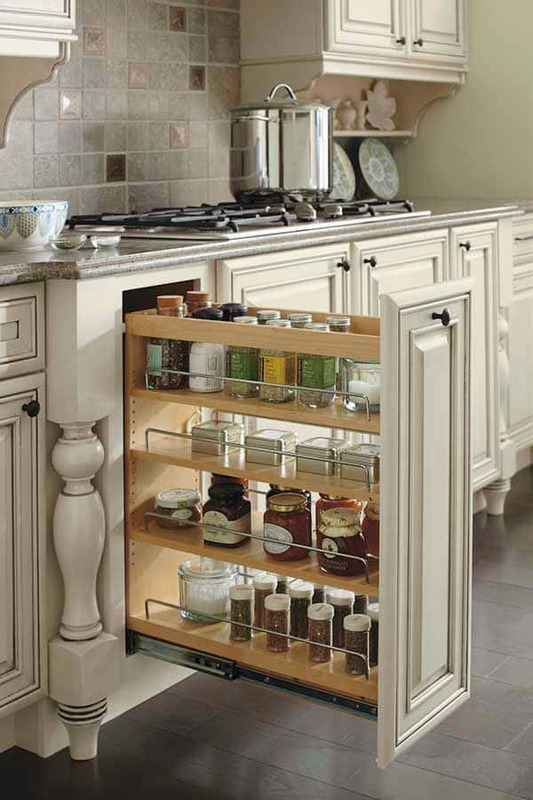 Having the spices eye level in the bottom of an upper cabinet is a very convenient location and with the addition of an acrylic set of steps allows the user to easily see all of the spices at a glance with great accessibility. 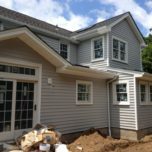 This feature is easily expandable, highly efficient and very cost-effective. 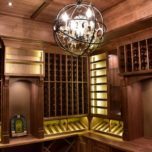 Need help with all the cabinet organization options?